One can't help but sense the Creator's low-key laughter. Talk show host Rush Limbaugh said this past Thursday that God has a sense of humor and has shown it this week over Copenhagen, Denmark. My thought about Rush and his talk show is like the thought I once heard expressed by Jerry Falwell. He said that he likes what Rush says in many cases, but didn't always like the way he said it. I don't like God's great name being loosely bandied about, as secularists are prone to do. However, I must say that I am in total agreement in this case. The Lord God must indeed be expressing a low-key chuckle of displeasure above the Copenhagen global warming summit, while many leaders from around the world try to act as if they seek solutions to dangerous warming of the planet, as they view it in their flawed perception. I say "act as if they seek solutions to global warming" because I believe they, more than anything else, seek to fleece the flocks of the globalist religion called environmentalism - Mother Earth worship. They have been partly successful in this endeavor - at least considering lip service. Secretary of State Hillary Clinton has pledged the U.S. administration's agreement to work with other wealthier nations to provide $100 billion annually to fund making the third-world nations environmentally clean. This insanity is proposed while America is trillions of dollars in debt that will never be repaid if the planet were to survive to produce a hundred more generations of taxpayers. The fleecing is well underway, led by the likes of Prince Charles of Great Britain. The following news item frames the alarmists' message. The world has only seven years before climate change causes a “point of crisis” that will drive food shortages, terrorism and poverty, the Prince of Wales has warned. 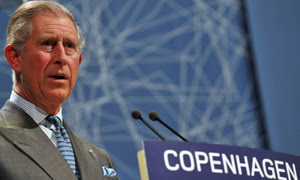 Speaking at the opening ceremony of the ministerial segment of the Copenhagen climate conference, the Prince said the "survival of the species" was in peril. The talks have been dogged by walk-outs and protests as the poor world becomes increasingly frustrated at the lack of refusal by richer countries to cut greenhouse gas emissions. So, Prince Charles and the other gurus of globalism don't intend to lose the "levers of control." Pulling those levers has been former Vice President of the United States Al Gore's mission for years, while he jets about in his air yacht, spreading fear and leaving his carbon footprint above the nations of the world. It has been personally amusing to me over the months to hear even mainstream news journalists joking about how it seems that everywhere Gore travels preaching his radical environmentalism ideas, the weather has failed to cooperate. Inevitably, the weather has turned cooler wherever he has traveled. The Lord's sense of humor seems to be manifest again above the global warming summit. Global warming will first face freezing weather as a blizzard dumped 10 centimeters (4 inches) of snow on the Danish capital overnight. "Temperatures will stay low at least the next three days," Henning Gisseloe, an official at Denmark ’s Meteorological Institute, said today by telephone, forecasting more snow in coming days. "There’s a good chance of a white Christmas." The Almighty's patience is being tested at every turn in these hubris-filled days of mankind demanding to do what is right in their own eyes. How long might it be before the Lord's longsuffering has reached its limits? It is interesting, don't you think, that Prince Charles has stipulated that man has only seven years to save the planet? Bible prophecy forewarns of a coming time when the Lord will lose His sense of humor over man's incessant defiance of His prescription for conducting life on the planet He created.